Following in the footsteps of the original NavNet TZtouch, TZtouch2 features a refined user interface that is all about usability. 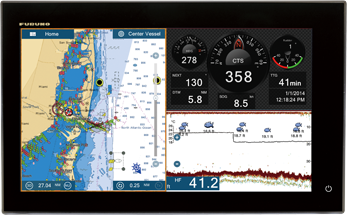 Elegantly designed, NavNet TZtouch2 allows you to build a navigation suite that is not only functional, but offers a luxurious look and feel. Taps, swipes, pinches, and custom multi touch gestures are instantly transformed into action, giving you full control of every component connected to your network. The NavNet TZtouch2's Multi Touch graphical user interface sets a new benchmark for "easy to use" in the marine electronics industry. This interface is not only intuitive, but is as easy to use as the phone in your pocket. With taps, slides and swipes, you will be up and using your TZtouch2 in no time at all. Menus and other features slide out from each of the sides of the screen, ensuring that the most important tasks are literally right at your fingertips. NavNet TZtouch2 is a component-based system that utilizes Furuno’s award winning network products. You can add a variety of UHD Radars, from a 4kW NXT Dome up to a 25kW X-Class Open Array. As with NavNet TZtouch, you can integrate, display, and control the NavPilot Autopilot, and Furuno’s FI70 Instrument. Both of these products have displays that match TZtouch2, giving your helm a beautiful all-glass finish. Additional sensors that can be added to the network include AIS, Weather Fax, Sirius/XM Satellite Weather, Fusion Marine Stereo, and IP Cameras, as well as NMEA2000 and Furuno CAN bus devices. It even includes one NMEA0183 output port to send data to legacy systems. The weather tool is completely free and easy to use, giving you unlimited access to weather forecasts worldwide 24 hours a day provided by NavCenter. Select geographic coverage, data type, period of time, and then choose how to receive the file. NavNet TZtouch2 provides up to 16 days of weather forecasting. This unit utilizes a 10-pin Transducer/Multisensor connection. These transducers enable all standard Fish Finder features including RezBoost, but DO NOT support Bottom Discrimination. To utilize the Bottom Discrimination mode of the TZTL15F please select a transducer from the "Bottom Discrimination Transducers" list.